This legacy version of the DreamLight Portfolio is being kept online while we move all our content over to our new website. For updated higher resolution versions of these samples as well as new samples please visit our NEW DreamLight Portfolio. DreamLight creates 3D medical animation and 3D medical illustration in styles ranging from simple graphic representations to photorealistic renderings. We communicate closely with our clients throughout the entire animation/illustration process to ensure the most reliable and accurate results as we progress from initial 3D model building through rough OpenGL render tests to fully finished renderings. Whether you need to demonstrate a complicated medical procedure or how an intricate new medical device operates, DreamLight can bring your concepts to life as we have for so many of our other valued clients. 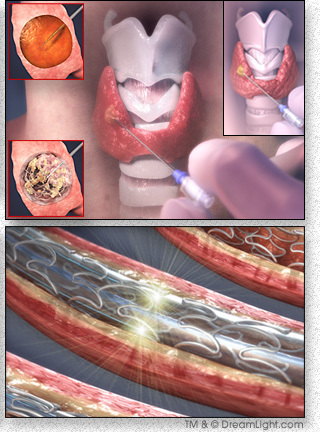 UCLA Medical Center needed 3D medical illustrations for publication in a medical journal to illustrate a thyroid biopsy procedure and the difference between benign and malignant tumors. DreamLight worked closely with the head physician to quickly create 3D medical renderings that were exactly what they were looking for. They clearly showed the larynx, trachea and thyroid biopsy procedure in a manner not possible with photography. DreamLight created two different versions of the same procedure illustration for this project, a simple stylized graphic version as well as a more photorealistic rendering. CorNova needed a visual demonstration of their new fiber optic enhanced (DES) drug-eluting stent deployment system so they turned to DreamLight Interactive. DreamLight built 3D models of their custom designed coronary artery stent as well as the fiber optic enabled balloon catheter stent delivery system and a section of a coronary artery. We then created a series of 3D medical animations depicting various stages in the angioplasty and stent deployment process including versions for pre-dilation, post-dilation and DES stent deployment. If you would like DreamLight to create 3D medical animation and/or 3D medical illustration for you, please contact us today.